Explore MKE by kayak! Milwaukee Kayak Company rents out both single and tandem kayaks for up to four hours at a time. Book a guided tour, or venture off on your own and stop at local breweries, restaurants and bars along the way. Feeling adventurous? Float downstream on a stand-up paddle board! Surfing? In Milwaukee? You betcha. Lake Michigan is home to some big-time waves making it the perfect freshwater surf spot. If you’re looking to ride the tide, give Lake Effect Surf Shop a call and they’ll set you up with all the gear you need for a day on the water. Whether you’re craving a romantic sunset ride, or a lesson on how to navigate the Great Lakes, the Milwaukee Community Sailing Center is the perfect starting point. Take the wheel and learned the ropes, or sit back, relax, and enjoy the ride. Anchors aweigh! MKE’s first pedal-powered bar-hopper has just set sail on the Milwaukee River. Start off your 1 hour and 45-minute Paddle Tavern tour at The Harp, and sip and see all your favorite riverside bars along way. Don’t forget to BYOB! Pack a picnic and enjoy the perfect urban beach day at MKE’s best swimming spot, Bradford Beach! 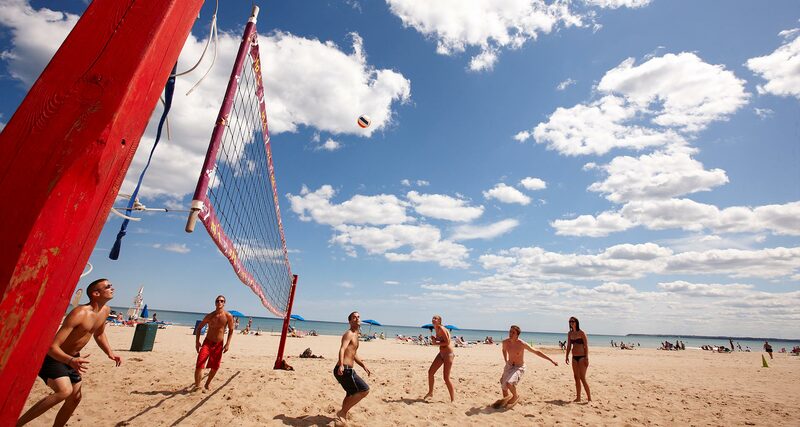 Challenge new friends to a sand volleyball game, spend the day sunbathing in your own cabana, or treat yourself to a quality Cream City treat at Northpoint Custard.